Scrapping Mommy: Peachy Challenge 9 - Kiss Me, I'm Irish! Peachy Challenge 9 - Kiss Me, I'm Irish! Hi everyone!! Sorry I have been a little MIA. I my family has passed around a terrible stomach flu for the past couple of weeks and I had to take my turn. Fortunately, I was able to get this card created for the challenge today at Peachy Keen Stamps. I really love the fun color combo for this week's challenge. 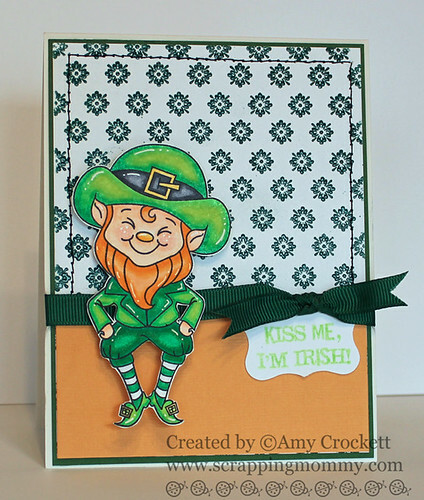 Since tomorrow is St. Patrick's Day, I used the colors in the challenge to create this fun Kiss Me, I'm Irish card. The stamps are from the darling Kiss Me Leprechaun set. The background is heat embossed with the Grampa's Pajamas background stamp. I really hope you can hop on over the the Peachy Keen Stamps Challenge blog and play along with us and to also see what awesome projects that the other designers have come up with. This is super adorable!! I love the background stamp and the coloring is amazing! !